F and I’s’ Training Day 23rd May 2016 with David Pincus, hosted by Carol Bennitt. This was an excellent day in every way. Our Hostess is so welcoming, kind, encouraging and supportive. Our Coach is tops. Open to discussion. Complete horseman, encouraging to all, both human and equine. Understanding fully with an eye for detail resulting in noticeable progress with all partnerships. We were encouraged to “set the standard”. Prepare and ride our corners and movements well. We used shoulder fore, shoulder in. Haunches in, leg yielding half pass. Partnerships were encouraged to stay in balance; self carriage; to “deal with issues” if/as they arose. Horses must “give” in the poll, their jaws with activity created from behind. In Hand work: From a good halt, encourage a good walk, then progress to small steps. Then reward. On behalf of all attendees THANK YOU CAROL and DAVID. Next date, PLEASE. Thank you to Emma for our delicious lunch. The weather at Judy Harvey’s (Monday 9th May) could not have been more different to last year when it poured with rain and Judy had put up a gazeebo to try and keep the spectators dry. This year it was needed to keep the sun at bay!!! 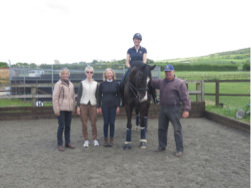 Four BHSI’s rode with very different types of horses ranging from a 5yr old to 19yrs, Novice to Advanced, cob, warmbloods and Iberian. Each partnership was discussed and there were many ways to achieve better quality within the work but without compromising the welfare and harmony that the riders had with their horses. The spectators – some ‘I’s and others coming through to take their Senior coaching exam were able to ask questions and got sound, experienced advice from Judy. After lunch those who wanted to were able to coach a session with Judys’ staff and apprentices and gained valuable feedback at both ‘I’ and ‘F’ level. A huge thankyou to Judy and all her staff for what I feel was one the best days we have had. A group of 12 members and their guests including three Irish representatives gathered at fence 2 for the annual course walk. This year we were lucky to have Eric Smiley FBHS as our guide. Eric began by explaining that there would be three groups of riders walking the course that day. The “oh my goodness I have made it here “ contingent. The “ I want to complete” riders and finally the riders who would be competitive. Everyone starts the course with 3 buckets, one containing the energy, one honesty/confidence and one containing the time given to complete the course without penalties. The goal is to manage the contents of the buckets round the course so that you make the best use of the horse’s energy whilst maintaining his confidence level and keeping up with the clock. Eric then took us on the journey around the course. He is a master at looking at things from the horse’s perspective. At each fence he discussed the options, what things would take the energy out of the horse, such as needing to change direction and leg a number of times, the rider taking pulls and the wrong camber in the ground. The emphasis all the way round the course was Pace and Line, you only need one stride straight to jump the fence. Practice at home so when the course builder tests you, you are ready. Teach the horse to make quick decisions but ride so he has time to make the right decision. As we entered the intense part of the course Eric emphasised the need to be having the debate with yourself about managing energy (taking the direct route) versus maintaining confidence (choosing alternative routes). The important thing here is to recognise the mental stress for the horse of answering so many questions in a short space of time and for the rider to recognise if the horse is losing focus. Eric explained that good course builders understand how horses think and so towards the end of the course fences are positioned well to make it easy for tired horses. However riders still need to adapt to the horses energy levels on the final few fences, holding the line but allowing the horse to find the stride. It was somewhat prophetic as it turned out, sadly. I have only managed to pass on a snippet of Eric’s wisdom here. He is a master storyteller and made us feel as if we were riding the course ourselves. Thank you Eric, it was brilliant, although I am still trying to work out how to jump all those fences carrying three buckets………..